“Sustainable Development Goals” (SDGs) is an international program scheduled to operate from the years 2016 to 2030. It is essential for achieving these goals to do continuous activities to create the sustainable society in each region and the involvement of variety of generations. In March of 2017, seven high school students from Ehime began a group called “Waku Waku Youth,” whose keyword is “SDGs” and whose goal is to do what they can in their local area. They are trying to create a place where youth can learn and educate each other in order to look for what youth can do with their capability and solve glocal problems like international relations, education deficits, environmental challenges, etc. “Fair trade” is one of the themes they’ve been focusing on since the start of the group. Fair trade is a trading method with fairness and consideration for producers. Fair trade is related to the goal #1, “No Poverty”, goal #12 “Responsible Consumption and Production,” and some more SDG goals and also has deep connection with the ideas of “ethical consumption” and “thoughtful consumption” which is getting more attention in Shikoku recently. At the end of March, they visited Zushi Kanagawa, the third city to be qualified as a fair trade town in Japan. With the help of Fair Trade Town Zushi, they met and discussed about city development with local government and a citizens group, with the mayor of the city, and young people. They also took part in the “Fair Trade Festival in Kagawa” held in cooperation with “Sanuki Marchais in Sunport” in Takamatsu, Kagawa, on May 21. 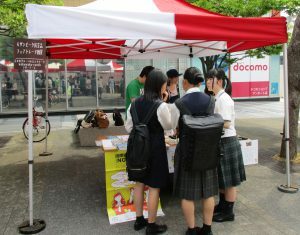 Waku Waku Youth sold fair trade goods and interviewed about fair trade to visitors. They also had a chance to talk to local students and deepened their thoughts so they could gain a clue to keep their activities well. They have learned global concepts like ESD and SDGs and have been trying to find things they can do locally since the launch of the group. One new activity is to make a booklet which explains fair trade. One example they will give are the hair bands with large embroidered buttons on them that are handmade by village women in Mozambique. This participation in the small-scale economy helps Mozambican women to be independent yet productive. Waku Waku Youth has requested of barber shops in Ehime to sell these hair-bands in their shops. The glocal activities of Waku Waku Youth to create a sustainable society are remarkable. The “Adopt Program,” in which local people or companies take care of their roads and rivers, is now widely spread around Japan. The very first town to adopt that program was Kamiyama, Tokushima. Twenty years ago, in June of 1998, four citizens’ groups held a cleanup campaign for the first time. The cause of this program is when Mr. Ominami, the board chairman of Green Valley, saw California’s “adopt a highway” program which companies clean stretches of highway. He realized that this kind of system would be necessary in Japan soon. At that time in Kamiyama, the International Communication Association was formed and a new movement to revitalize the town with art and environment had just begun. The “Adopt Program,” which was very successful in the USA but no adaptation in Japan, was set to be the core of the environment project. They wanted to make trash-free streets as a way of cultural expression. Green Valley proposed the project to the local government but the government declined funding of road signs with a company’s name on them. In response, the group started their own project. They themselves built road signs with sponsors’ names on them and local people volunteered to clean up streets around the town every two months. In October 1999, about a year after the program started, they finally got support from the prefectural government for road signs and the clean-up project became an ordered program called “Tokushima OUR Road Adopt Project.” This program quickly spread to 46 other prefectures across Japan. There are partnerships by 374 municipalities and over 2.5 million participants with around 500 programs (according to The Beverage Industry Environment Beautification Association).